Ducks fall behind the chicken when it comes to America’s most popular barnyard fowl but in Asia, and many places in Europe, the duck reigns supreme. Why Ducks? Well, why not? The new website / blog, Why Not Ducks, will have information on duck care, duck health, duck breeds, duck abandonment and adoption, duck egg nutrition, duck stories, and other duck related information. Should I own ducks? What is the best diet? What protection do ducks need from predators? Are all ducks the same? What does duck ownership involve? Did you know that ducks who are kept in a safe, healthy environment can live to be over ten years old or that only one breed of domestic duck originates in North America? If you don’t, and are interested in more duck facts, are considering duck ownership, or just find ducks to be amusing, drop by and check out the website / blog Why Not Ducks? These a few facts one should know before buying a duck. Those little fuzzy cuties you take home won’t stay little fuzzies for long and will need some care. I can’t say all domestic ducks can’t fly but they can’t fly far and they don’t have the ability to migrate like wild ducks. Consider these things before buying or obtaining a duck. Author adminPosted on May 5, 2017 May 5, 2017 Categories Duck abandonment, Duck Care, UncategorizedLeave a comment on You Know? Hi. My name is Smudge and my younger friend is Midnight. We are born and bred in America and are both quite patriotic. We are Cayugas which are the only breed of domestic duck originating in Northern America. Cool, huh? We were both named by Yvette’s friends who work in insurance. I was named by Lisa who works at Grange Insurance and Midnight was named by Heidi who works making websites with the Nick Watson Agency. You might notice that I am part white. We Cayugas are jet black and in the sun we have a gorgeous beetle green. I was all black like Midnight a couple years ago but then I started getting some white feathers. This year, as you can see, I have a lot of white. You don’t need to be startled because this happens quite often. Cayugas, especially the girls, get mottled with white as we get older. I’m only two now and didn’t expect to be quite this white by now. I hope my white feathers make me look classy and distinctive. Hi, My name is Midnight. I am a Cayuga Duck and Cayugas are real Americans. You can read more about that later. Momma & Poppa Duck adopted me and two other ducks last fall when we were still pretty young. Probably someone abandon us after Easter but we’ll never know for sure. Momma & Poppa Duck wanted to adopt some more duckies so Momma Duck contacted a lady named Judy who rescued us from a local lake. I’m a little shy but I’m willing to eat goodies from Momma Duck’s hand. I especially like dried meal worms. I like them even more when they are thrown on the water. All of us shoot out in the water hoping to get to them first. I’d never had treats like frozen peas, watermelon, lettuce, bean sprouts and dried cat food until we moved up here to our new home. I was a bit leery of them at first but now I think they are great. It’s nice having some new friends. I hang out with Winchester who has been with my new owners for quite a while. Most of all time though, I hang out with the two buddies who were adopted the same time I was. We’ve all grown a lot since we showed up. Trixter even changed from female to male plumage since we came. It tricked the lady who rescued us but didn’t fool Mamma and Poppa Duck for a minute. The Cayuga duck is the only breed originating in North America. The name “Cayuga,” is taken from Cayuga Lake, so called after a local Native American tribe in New York State where the breed originated. The Cayuga is a medium-weight duck, weighing an average 8 pounds for mature males and 7 pounds for females. The Cayuga have a jet black bill with occasional olive tips and the feet are black to dusky. The plumage is a beautiful jet black with an iridescent beetle green shimmer in the right light. The wing tips shine from green to deep purple as the light direction changes. 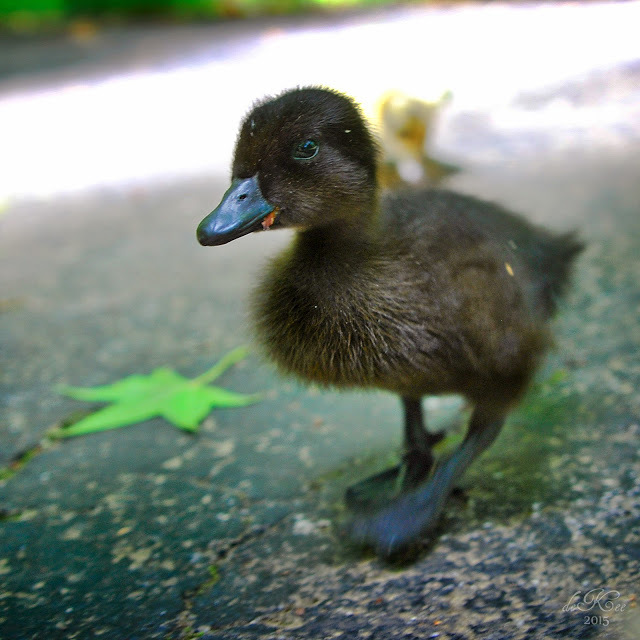 Ducklings are coated in fuzzy black down that won’t show green until the feathers come in. As the duck ages the feathers will eventually become mottled with white until it’s almost all white. This changing of colors occurs much quicker in females than males. In addition, their black legs turn more orange as they mature. To be honest, while studying the Cayuga before writing this post, I found that much of what I read doesn’t seem to follow my own two Cayuga. For example, the only blackish egg was a tiny black egg that I think was laid by Smudge before she started producing on a regular basis. The eggs are not a dark grey. The ones mine lay are a slight gray but not enough to make them distinctive. They are a friendly, mostly quiet duck. Mine quack a few louder quacks when they see me approaching the pen but other than that, they are not very loud. These ducks are also very intelligent. I have one that leads the way to the trash can each morning, knowing that I’ll come along and tilt the can so she can search for worms. She must remember that huge earthworm she found the first time. She is the only duck in our flock that does this so she must be quite smart. Momma Duck was planning to write about Lady Waddletail this month when a tragedy happened. Since I’m now in duck heaven, I’m not too sure if it’s a tragedy but it was to Momma Duck. My name was Aflack and I was Momma Duck’s first duck child. Two years ago the neighbors brought me over to Momma & Poppa’s home in a box with a brother and sister. A week later she brought another sister named Winchester. I remember the other brother and sister but they went to a friend whose duck needed company. 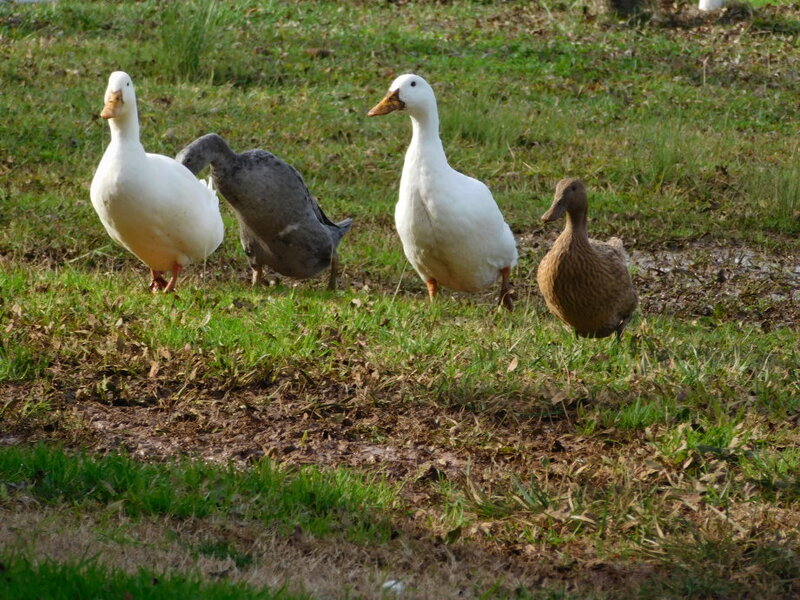 The other three ducks the neighbors brought weren’t really my brother and sisters because we are different breeds but we all came out of the incubator at the same time … except Winchester, who as always, came along in her own time. Winchester is still with Momma and Poppa Duck and is their favorite. Just don’t tell the other ducks or they might get jealous. I was with Momma Duck until a couple days ago. Momma Duck was sitting on the ground feeding us treats. I had been climbing in her lap to get all those little pieces of dry cat food … yum! I turned away from her and after walking about two feet, my right side collapsed. Momma Duck thought it was my leg and reached to help. At that time, my neck drooped over. Momma Duck told me to get up. I tried to lift my head I then just drooped over and went to duck heaven. I’ll miss the goodies. My very favorites were tomatoes, frozen peas and watermelon. The others won’t know for some time but the treats in duck heaven taste even better except that Momma Duck isn’t here to feed them to me yet. Aflack was a Pekin duck who was well loved by her Momma & Poppa Duck. She will truly be missed. Her little friend Winchester misses her and does look for her. It is a very sad thing to see. They were BFFs and the forever ended far too soon for Winchester. Pekin ducks are the most common domesticated duck and the one most commonly thought of when people mention a duck. The famous Aflac of TV commercials is a Pekin duck. The Pekin has been raised as a farm duck since at least 2500 BC in the area of Beijing, formerly known as Pekin China. They were introduced to America around the 1870s. I read that a fellow saw the Pekin duck in Beijing, hatched 13 eggs under a chicken and had a friend bring them to America for him with the stipulation that the gentleman taking the ducks would get half the flock. It is a good thing since the half hatched out by the first gentleman never made it further than someone’s dinner plate. The other man took care of his ducks and he had the first Pekin flock in the US. The Pekin are most commonly used as a meat duck. However, the are wonderful pets who can be friends with their humans. Pekin ducks begin their life as little yellow ducklings with bright orange legs and bills. As they get older they turn white with orange legs and bills. Laying females will get lighter bills and legs as they get older. The bill will sometimes get quite dark with what I call “freckles.” The freckle patterns do help me figure our who’s who in the duck pens. My name is Winchester. I am a two-year old Khaki Campbell female and I am a rogue. Being a rogue, I don’t mind spending time away from the rest of the flock. I am an expert at escaping from the duck yard. My second name is Houdini and I’ve been like this since I was just a little sprite. I’m not sure why, because I don’t want to run away, I only want to go into another section of the duck yard or into Momma & Pappa Duck’s back yard. Last year I used to fly over the fence but now I just look for a hole large enough to get my little body through. Before she died suddenly my BFF was Aflack. She was a female Pekin. We were the oldest two ducks in our brace. We were born about a week apart in the same incubator. I just waited a week longer than she did to exit my egg. You’d think a Houdini like me would be in a hurry to get out of the confinement of an eggshell. Laying eggs is very important to me and I lay an egg almost every day. My breed is the top-notch when it comes to laying eggs. Us Khakis lay an average of 300+ eggs a year. Not bad, huh? We aren’t very famous for brooding our own eggs though. Can’t be best at everything I guess. I do like snacks. One of my favorites is dry cat food. I will get in Momma Duck’s lap to grab a few kibbles. In the summer I love watermelon, fresh lettuce and peach peelings. Although dried meal worms are tasty, my very favorite treat is a nice fat earthworm. The Khaki Campbell is a breed of domestic duck developed by Mrs. Adel Campbell of Uley, Gloucestershire, England at the turn of the 19th century. Indian Runner Ducks are a breed unto themselves. They have no concept of a “waddle.” As their name implies, they run and look quite adorable doing so. I have included this video to show what they look like and their purpose. Although I have two as pets, they were originally bred to forage in rice paddies. Many walk over 1,000 miles in a lifetime. Although they are called Indian Runner Ducks they are not from India. They were first bred in Asia and were taken out in the rice fields every day to forage on bugs and other little pests. The ducks were walked out each day. A flag was put up and the ducks were trained to stay within sight of the flag. In the evening they were walked back and put into their pens. The owners did not turn them loose until around 9:00 so they would lay their eggs in the pens and not out in the field. The breed made their way to England when trade opened up between the two countries. Once in England they became very popular. They can be found in various colors including white, chocolate, black, fawn and white, penciled as well as some more exotic colors such as lilac. They stand fairly upright and look a little like bowling pins or wine bottles. Although they are described as “flighty,” most people who have them as pets, such as myself, find them to be quite personable and friendly. A bit more regarding Runner Ducks in a couple days. 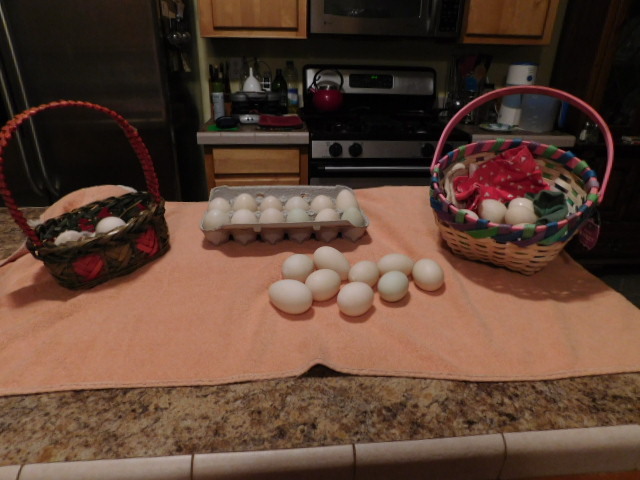 I had planned to write about Cayuga ducks this week but instead decided to share a photo of my ducks’ eggs. Every day the ducks have been contributing at least six eggs to my growing collection. All duck eggs do not look alike. The large ones are usually laid by the white Pekins (Alfack, Quacker and Lil’ Darlin’.) The medium are from Winchester (Khaki Campbell,) Smudge Underwriter (Cayuga,) or Lady Waddletail (Welch Harlequin.) The smaller ones are from the Indian Runners (Fire Fawn and Smoke Frecklefoot.) The light blue one is from Smoke. All of them taste wonderful. Bake rs like to duck eggs because the goods are more moist and rise more. They make fantastic deviled eggs but Momma and Papa Duck use them for everything. Duck eggs are especially nutritious and are sometimes good for people who are allergic to chicken eggs. Here is a chart for those of you who like to know the nutritional value of your food. Why Not Ducks? is presently a work in progress. The site is going to be a website/blog that will include information about duck care, duck health issues, duck breeds, duck egg information, duck abandonment and adoption, general duck information and true life duck stories. It will hopefully have info to help duck owners and potential owners but It should also be just fun for anyone to read. My plan is to attach this to a dedicated Facebook page. When that happens, I hope I get some “likes” and some friends. This site and blog will take a few weeks to develop so please be patient. In the meantime, if you see those fuzzy adorable creatures with those cute little bills and webbed feet in the farm or pet store, please don’t buy them for someone’s Easter basket. First off, ducks poop ALOT and no one is going to be endeared with a creature that poops in their Easter basket. Ducks are not the neatest animals and poop ALOT. I have found no way to keep the brooder clean for more than two seconds. Unless you have studied and read information about duck care, please don’t buy the little cutie. The wrong food or careless handling can cause life-long health issues. Many people abandon these ducks after a few weeks when they discover that they are more work than they imagined. Please don’t be one of those folks who leave the duckies by the local pond or lake thinking you are doing them a “favor.” It is no favor, but we’ll get to that in a later post.